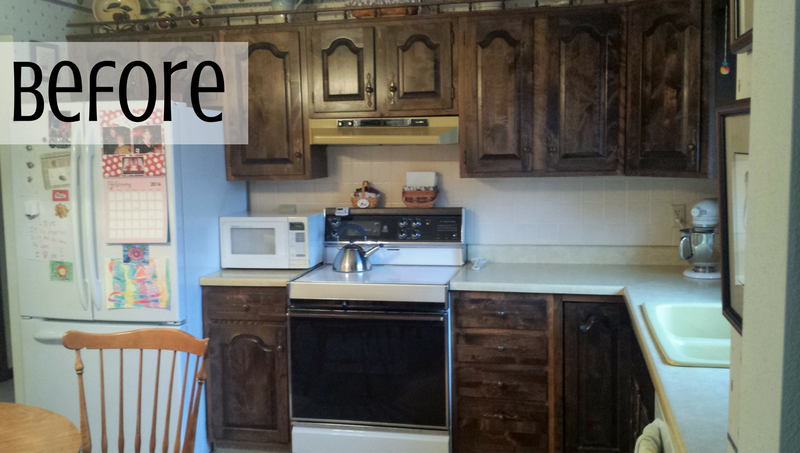 This Moline, IL kitchen is a tale that we are sure many can relate to. The original kitchen cabinets were in a very functional layout but beginning to show the wear and tear of years of use. After years and years of “maybe someday I’ll replace them”… this Spring “someday” had finally come. Now the kitchen is updated with new cabinetry plus we removed an entire wall to make room for an island in the new design. The original kitchen shared the same L-shaped layout but the opposite end had a corner of walls with just enough room for a small table and two chairs. Now with one of those back walls removed, the kitchen is open and bright. Birch wood Cabinetry from our Koch classic line has been installed in the “Westbrook” door style. A “Chestnut” stain has been applied and a “Black” accent glaze highlights the door and trim details. 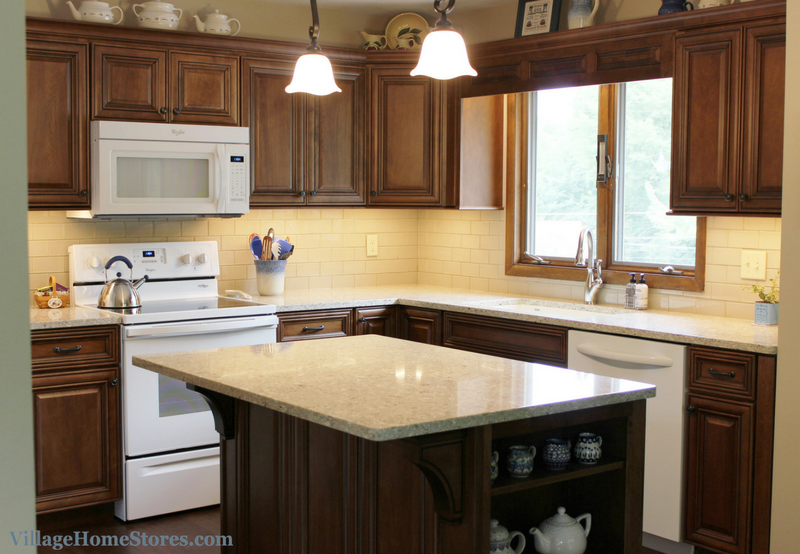 Engineered Quartz countertops in the “Chakra Beige” design is a neutral tone-on-tone look. The spindle rail crown has been removed from the original kitchen. 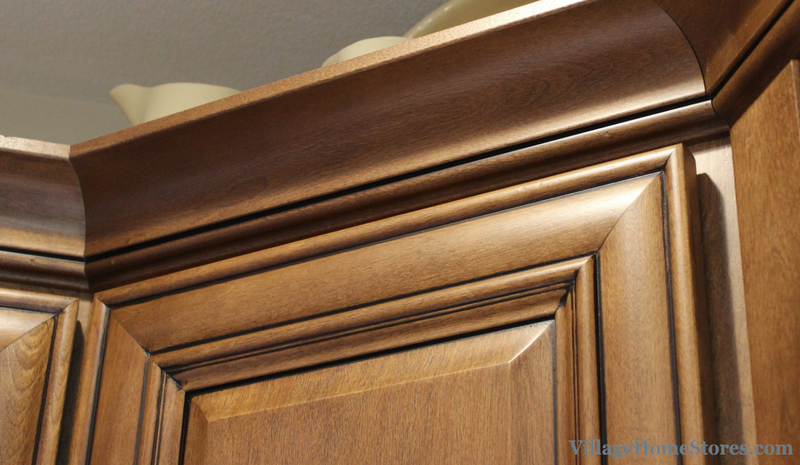 The new kitchen look is updated with “cove” crown molding. This crown is the perfect style and scale for the project. It even includes an area for the accent glaze to catch. 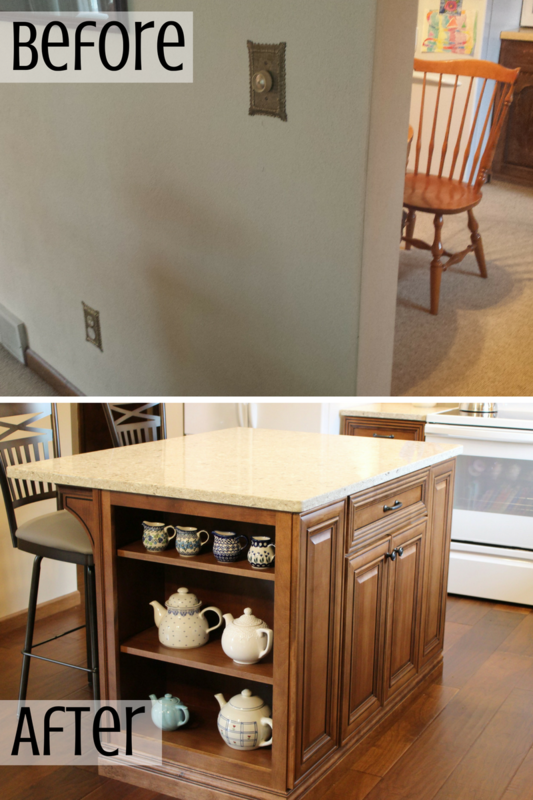 With plenty of cabinet space within reach on each wall, an area above the cabinets is left to display items. A white Whirlpool® range and microwave hood are also part of the new kitchen. 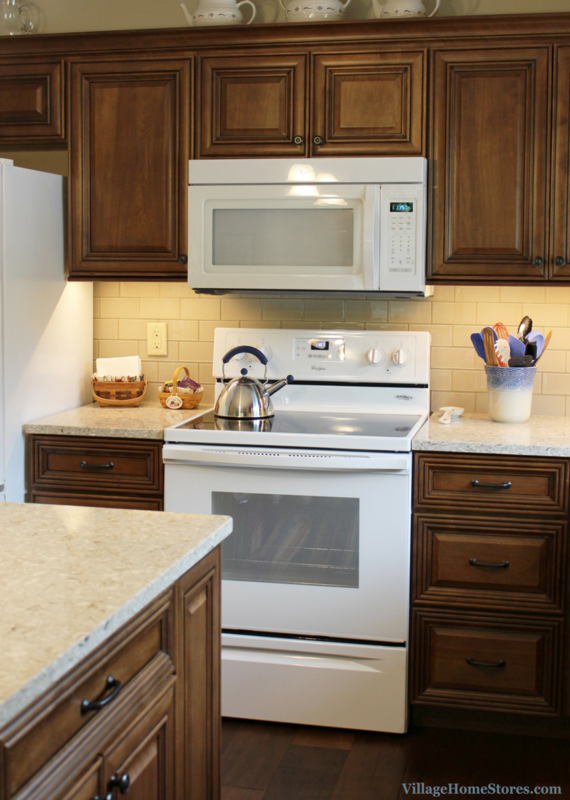 Microwave hoods can save counterspace and be installed to vent out of the home or re-circulate the air. The original kitchen had just a range hood installed, now the microwave is off the counter. The new electric range includes an easy-wipe ceramic glass cooktop. The most dramatic difference in the new kitchen came when we removed a wall that divided the kitchen from the dining room. Removing this one wall has helps this kitchen seem to grow in space even though it hasn’t extended any further into the dining room than before. The small table and chairs is now replaced with a large single-level kitchen island with seating for two comfortably. With open shelves installed on each end of the island, the largest base cabinet included faces in toward the kitchen sink. Behind the double doors of this cabinet are two slide-out shelves. The “ends” to each open shelf cabinets have been treated with “applied doors” on each side. This gives the illusion of doors and helps complete the look instead of just a smooth panel. The back of the island includes three applied doors and two wood decorative supports for the overhang. The island is really the focal point of this new kitchen and the accent glaze highlights all of the details perfectly. 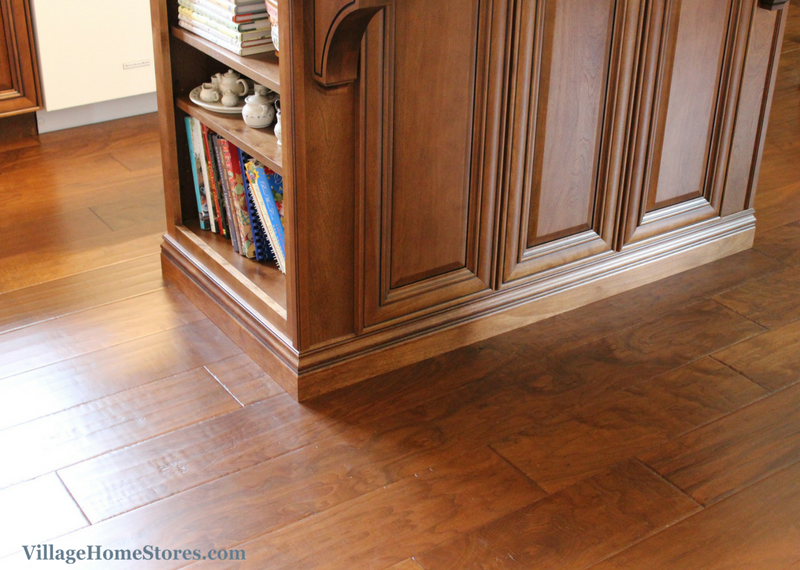 While the island steal the show in the kitchen, the new hardwood Walnut flooring is now showcased through the entire upper level of this home. 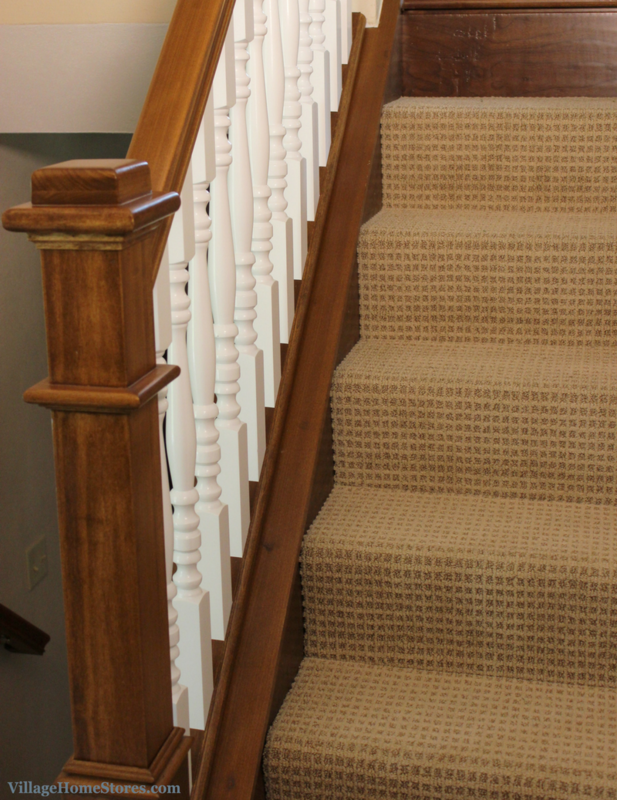 The Walnut hardwood in the “Saddle” finish is from our Hallmark Hardwood line. Read more about Hallmark and some of our other projects here at this link. This homeowner knew that she wanted to be sure to include our LED undercabinet lighting in her new kitchen. She had seen this system in our previous projects and on our TV show so it was at the top of her wish list for the new kitchen. 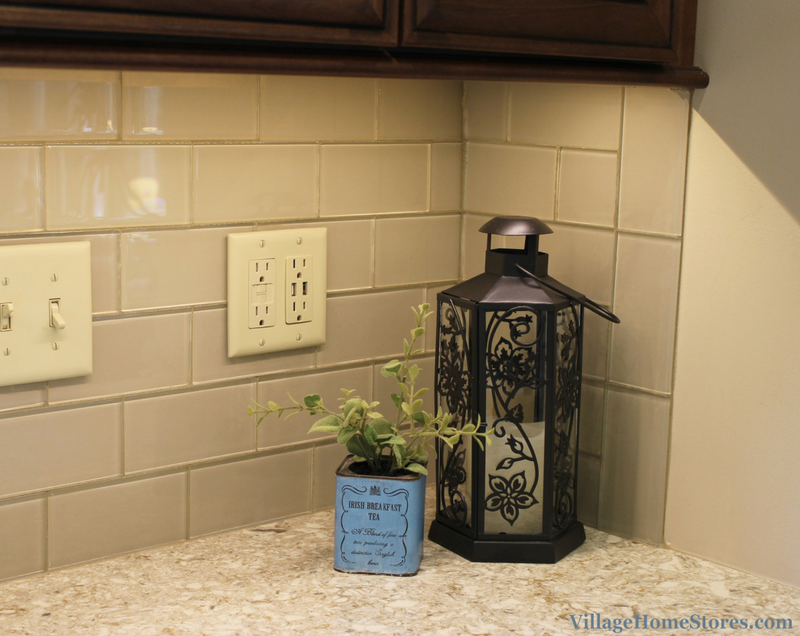 That lighting was a great investment to help showcase her new subway tile backsplash in the kitchen. 3″ x 6″ glass tiles from our Jeffrey Court line in the “Buff” color are the perfect choice and pair perfectly with the countertops selected. We included the finished space in an episode of the Village Home Show. See a full video tour of this finished kitchen remodel by pressing play below. All of the permanent areas of the kitchen remain neutral in color and the same space cane now be accessorized in a number of ways without making any major changes. See the entire album of photos from this kitchen over on our Houzz portfolio. 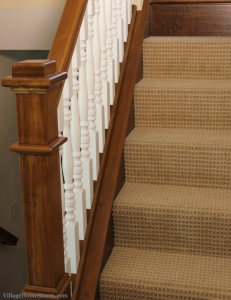 Part of the obstacle for many homeowners in the area is finding a contractor who can handle the entire remodel project from start to finish. 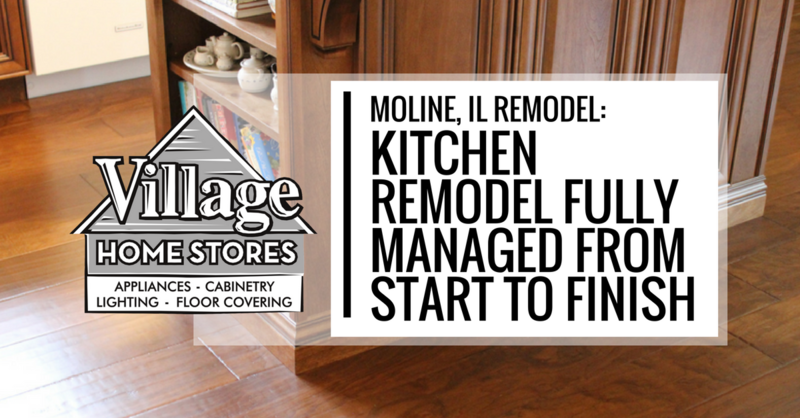 Village Home Stores offers a unique Project Management experience to our customers to do just that. From collecting the estimates to that final knob being installed, we can manage it all. Access to your project information and schedule is available 24 hours a day through our unique and secure login system on your desktop or mobile device. Are you ready for your own before and after story? If you have been delaying a remodel project because the thought of estimating, scheduling, and coordinating everything makes you dizzy… we are here to help you! 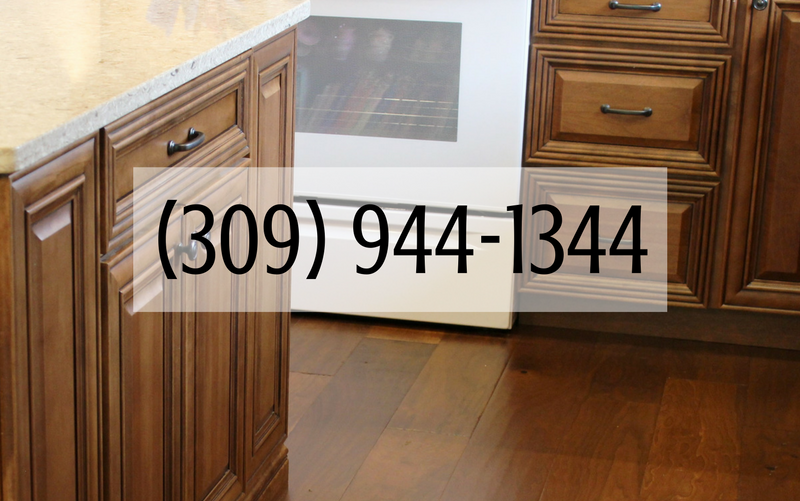 Give us a call or contact us online to set up an appointment and get started!